Bell is presently The Fleur and Charles Bresler Curator-in-Charge at the Smithsonian American Art Museum’s Renwick Gallery in Washington, DC, where he led the Gallery’s recent relaunch following a $30 million, two-year renovation. He has published seven books in the last five years, including six peer-reviewed exhibition catalogues and one edited anthology. 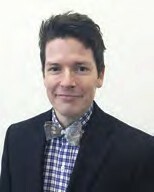 Bell earned a bachelor’s degree from Simon Fraser University in Vancouver, BC, and a master’s from the Winterthur Program in American Material Culture at the University of Delaware. He, his wife Allison and their three children are relocating to Mystic this spring.